With the arrest of the leading presidential candidate Luiz Inacio Lula da Silva, Brazil’s political future and the prospects for an improving economy have become clouded with uncertainty. Meanwhile, the rifts in society are widening: protests for and against Lula, outrage over the military’s growing influence and the violence against outspoken politicians are fuelling social tensions. And crime remains a significant and potentially increasing threat. 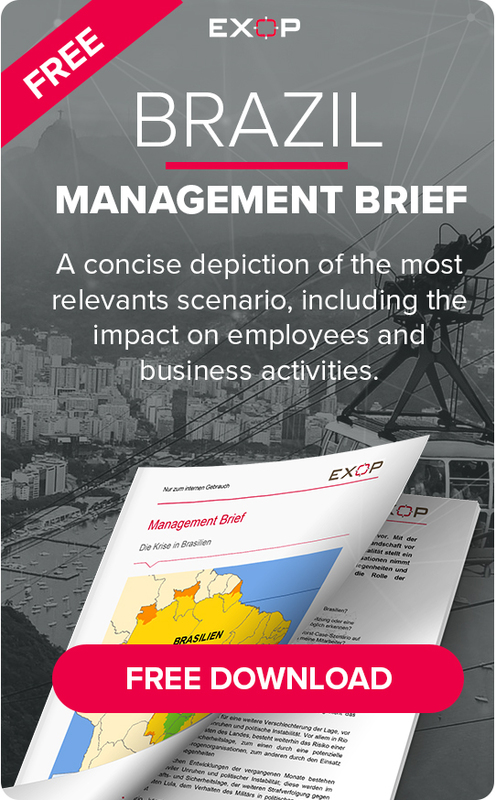 In order for you to stay on top of things in these demanding circumstances, EXOP offers you the one-time opportunity to download of the invaluable Management Brief Brazil for free. This product and its Early Monitoring Guide give you the means and tools to detect developments in their early stages and react quickly for the protection of your staff and business interests. When combined with EXOP’s unique mobility risk platform X-ASSIST, the Management Brief grants you the ability to identify and assess the first signs of a new situation, and thus reduce or entirely avert potential threats and adversities to your staff and business activities.